Some time back I wrote about the newly launched Oriflame hair colour. More than 2000 people saw that post and I really got excited when I saw that. Today I am going to share how to create volume hairstyles. I am going to share a video in which Oriflame products are used to create a volume hairstyles. You can do volume hairstyles for short, medium and long hair easily with Oriflame hair care products. 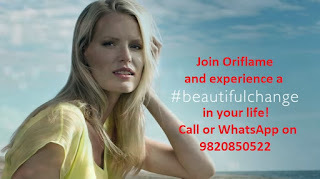 If you are looking for organic hair care products in India, Orifalme can be a good choice. Some of the other hair care products I use is the Milk and honey shampoo from Oriflame and the hair gel for women. I love Oriflame not only for the wonderful products but also for the wonderful business opportunity. I get to make new friends and travel around the world with Oriflame. I am excited about the next Oriflame trip. Check out this video for details.